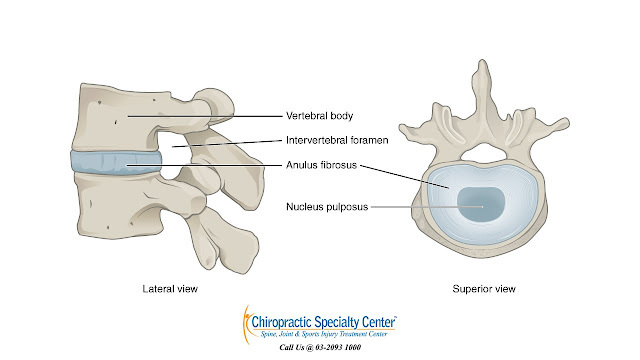 Spinal discs are one of the joints that contribute to the movements yet provide stability to a functional spinal unit. One functional spinal unit consists of two adjacent spinal vertebrae, the intervertebral disc and surrounding soft tissues (e.g. ligaments) that connect them together. Spinal discs are made up of the inner nucleus pulposus, outer annular fibrosus and cartilaginous endplates at the top and bottom surfaces that are in contact with the adjacent vertebra. The matrix of the nucleus pulposus is mainly water, collagens, and proteoglycans. As the nucleus pulposus is mostly made up of water, it can distribute forces evenly in all dimension when the weight is being placed on it. The annulus fibrosus contains layers of lamellae and collagen fibers. This multi-layered annulus fibrosus aligned in various angles provide the tensile strength and flexibility to the spinal columns. The cartilaginous endplates of the adjacent vertebrae are rich in microscopic blood vessels that supply nutrients to the spinal discs. Degenerative changes in the intervertebral disc are shown to occur in the early decades of life. As the disc degenerates, there can be significant variations in the structures of the intervertebral disc, associated ligamentous damage and structural alterations in the spinal columns. These degenerative changes can lead to severe neck or back pain with or without radiculopathies such as numbness, tingling sensation, and weakness. If degenerative disc disease is not properly care for, it will lead to slipped disc. If you happen to be the unlucky person who suffers from a slipped disc, worry not as we have the perfect solution for you. Our methods of integrative treatments and technology can reverse even a severe slipped disc. Find out about your non-surgical solution that the surgeon did not mention today. For more information the best slipped disc treatment in Malasyia, please log onto the best Chiropractic center in Malaysia now or contact us at 03-2093 1000.